Today was supposed to be Natalie's sweet one birthday party on the Prive Yacht. We were really excited to celebrate her birthday with family and close friends, but when we woke up this morning, it was raining outside and not just any rain, but BLACK rain! A little rain is alright, but, as daddy Clark would say, "This is aggressive!" Little Nat had no clue we had just cancelled her very first birthday party and was cheerful as usual hanging out with us this morning. 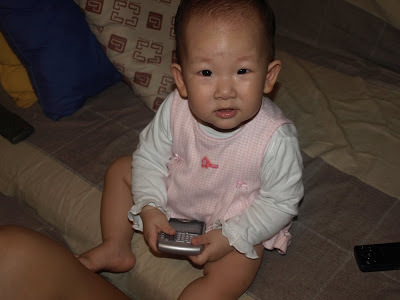 She was especially happy sitting on the sofa with us, reading a few books, and playing with our blackberries. Here are some pics below. Natalie smiling at us. She loves that we let her play with our blackberries. 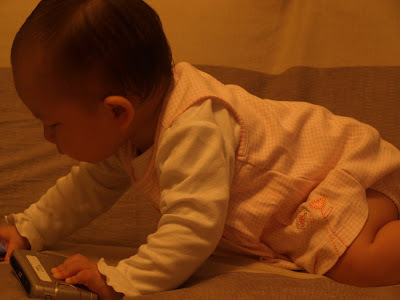 She'll push the little buttons with her little fingers and grin at us and wave it around when the screen lights up. More blackberry action. Look at the intense concentration. Doesn't it almost like she knows what she's doing? 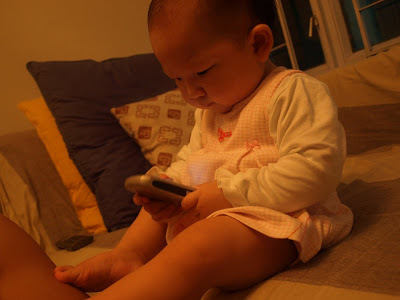 Natalie trying to show her daddy what she can do with his blackberry. Natalie crawling around on the sofa while she's, yup, hanging onto the blackberry.